You are here: Home » Regional news » Asia » Indonesia: Halal Certification: A Blessing or a Curse for Industries? Jakarta. Key players in the food and beverages, cosmetics and pharmacy industries are questioning the efficacy of the government’s Halal Product Certification law, which requires every product distributed in or imported to Indonesia to carry a halal label. “Halal is now a worldwide trend. We hope with this law Indonesia can become the world’s halal center,” certification and accreditation agency chief at the Ministry of Industry, Donny Purnomo, said in Jakarta last week. Indonesia has the largest Muslim population in the world, with 87% of its citizens professing to embrace Islam. The halal-labeling law — signed in 2014 by former President Susilo Bambang Yudhoyono — was meant to make access to halal products easier. Full compliance with the law will become mandatory starting October 2019, with a list of products subject to the halal certification to be introduced by a government regulation. So far, the regulation is only half-completed. The deputy operational manager of Indonesian Consumers Rights Groups (YLKI), Sudaryatmo, questioned the government’s commitment to the law. “They haven’t even formed the Halal Products Agency as mandated by the law,” Sudaryatmo told the Jakarta Globe on Tuesday (11/10). While consumers have the right to know which products are halal, Indonesian Employers Association’s (Apindo) head of public policy Danang Girindrawardana said the law might be premature. “Even though the government’s regulation will reduce the number of products that need to be labeled, there will only be an operational reduction,” Danang said. Secretary-general of the Association of Indonesian Food and Beverages (GAPMMI) Titie Sadarini said the problem is with the government’s move to turn a voluntary regulation into a mandatory one. “The current regulation is voluntary but it will become mandatory once the new law takes effect. You can’t expect growth with trade barriers like that,” Titie said. Enactment of the law may also give the impression that the government thinks its own citizens are irresponsible or cannot think for themselves. It has spent billions on drafting the law while most Indonesian Muslims already know very well which products are halal and which are not. 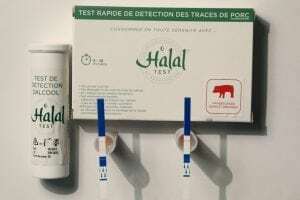 Market-wise, things will soon become more difficult and additionally expensive for producers, as the law stipulates that each ingredient of a product must undergo halal certification test. This presents a mountain of obstacles for producers of complex cosmetics and pharmaceutical products. It may even run them off the market altogether. A drug can contain hundreds of ingredients, each of them coming from a different origin. The process of registering a complex cocktail drug already takes up to two years. With the new law the wait will be even longer. “The pharmaceutical industry is required to support the National Health Insurance Plan (JKN). But it will soon become impossible for us to produce drugs that are of good quality, cheap and halal at the same time,” Frida Chalid from the Indonesian Pharmacy Association (GPFI) said last week. Parulian Simanjuntak, executive director at the International Pharmaceutical Manufacturers Group (IPMG), whose members include drug-making giants such as Bayer, GlaxoSmithKline, Merck and Pfizer, agreed with Frida. According to him, the law could divert public attention away from the effectiveness of a medicine to its “halalness” instead. “We’ll actually be limiting access to good medicines as we’ll be wasting our time getting separate certifications for dozens of ingredients just to produce one drug,” Parulian said. The same concerns will also haunt the cosmetics industry, which also relies on complicated formulas and imported ingredients. Also, as an industry where the products typically have very short lifespans, it needs regulations that allow a quick turnover of products, not slow them down. “If consumers can’t get their hands on the latest, trendiest cosmetics, illegal ones slapped with fake halal labels will quickly swarm the market,” a committee member of the Indonesian Cosmetics Association (Perkosmi), Dewi Rijah Sari, said. Dewi said the certification process may also lead to intellectual property infringement, as companies will have to open up their secret formulas to have the ingredients halal-labeled. Representatives of the pharmaceutical and cosmetics industries said the government has not sufficiently briefed them with the new law, let alone engaged their main stakeholders in a discussion to find the best way to go halal. These two industries are now getting ready to file a judicial review on the halal-labeling law. With all the difficulties that industries are likely to face to get their products certified halal, the law is now unlikely to position Indonesia as the center for halal products in the world. Instead, it may shut the country’s doors to foreign investment and put unnecessary burden on local producers.